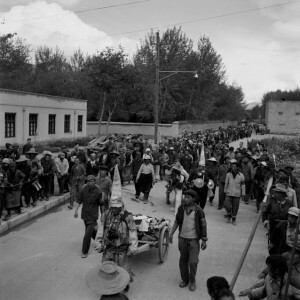 A street scene in Lhasa during the Cultural Revolution, Red Guards and enthusiasts – “upper layer patriots” – are parading. In the upper right-hand corner of the image is a square-shaped house, one of the military bunkers built by the PLA. When the Cultural Revolution engulfed the city of Lhasa, my father was a military officer of the Tibetan military district. He loved photography and over the course of several decades, he took a large number of photos, especially those taken during the Cultural Revolution are of immense value. I previously carried out some research based on these photos and published a book containing images and commentaries of the Cultural Revolution in Tibet, which was published 6 years ago in Taiwan: “Forbidden Memory: Tibet during the Cultural Revolution”. It included a series of images showing the “forces of evil”, student Red Guards and resident Red Guards, parading through the streets. Some images show a few people parading that were among the earliest to cooperate with the CCP – referred to as “patriots” – they were the aristocrat Tsogo Dhondup Tsering and the businessman Pangda Dorje and his son, they were wearing paper hats and Buddhist robes that were originally worn by deities protecting Buddhism, pulling a wooden vehicle filled with “stolen goods” of the exploiting class. The parading troops moved through the entire city and when passing by Changseb Shar (the official residence of the 14th Dalai Lama’s family and today’s Beijing East Road), in the upper right-hand corner of the image appeared a square-shaped house, two to three storeys high with four small windows on the site of the wall that were decorated in non-Tibetan style; nothing could be recognised on the other three walls. All the people from the older generation that I interviewed told me that this house was a Tibetan military bunker, it had been built in the 1950s and was roughly situated opposite today’s Saikang Shopping Mall. “These bunkers all belonged to the PLA?” I asked. 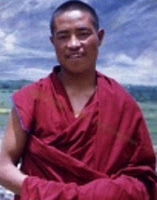 Sonam Dorje, was passing the police service station in Chengguan District of Lhasa, he was shot at by special police forces and died. Some say that the guns went off accidentally but others also say that the special police forces deliberately pulled the trigger. But isn’t it so similar to the scenes that happened in 1959? 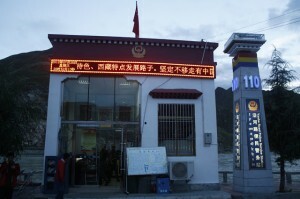 One of the 136 “police service stations” in Lhasa. 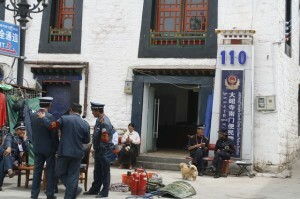 The “police service station” situated at the south gate of Jokhang Temple, on the floor we see fire extinguishers, steel forks and weapons used to “deal with” self-immolators. On January 19, a picture was uploaded onto Weibo by one of Lhasa’s police service stations; I don’t know if it is directed at the old man turning the prayer wheel or at the monk dressed in purple-red robes. 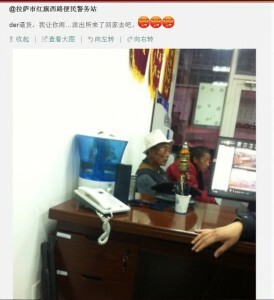 @Lhasa Hongqi West Road police service station said: “Idiot, I let you mess around… when the police comes, you go back home”. Because this post was commented on and forwarded too many times, it was deleted.